Looking east at the end of astronomical darkness a cone of light reachs high into the sky above the Okie-Tex star party. The big tent and most of the west observing field is visible in this view. The camera is level, the ultra wide angle lens used to take this picture distorts the appearance of straight lines. Interesting how much air glow is visible in this as well as the other images taken at the time. 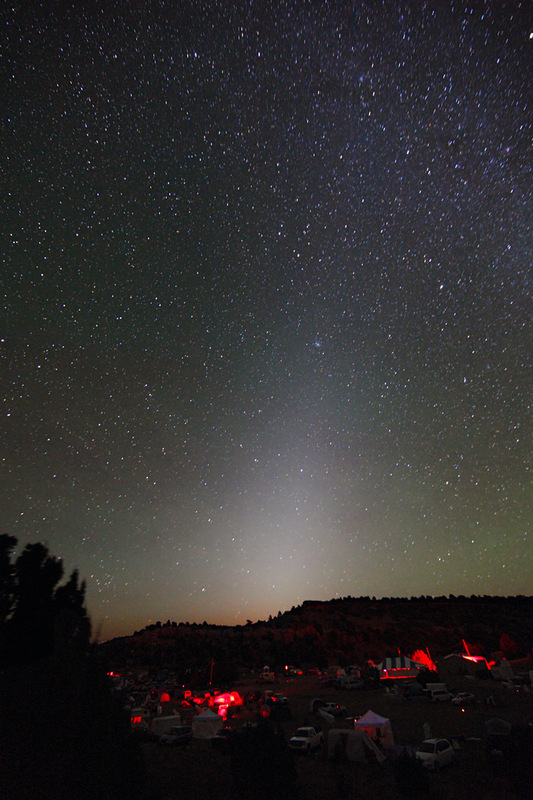 I wonder if the morning Zodiacal light is dimmer than that seen in the evening? Need to research this. Exposure 1 exposure of 60 seconds at ISO 3200 using in camera noise reduction. Notes Average transparency, temperature around 54°F.